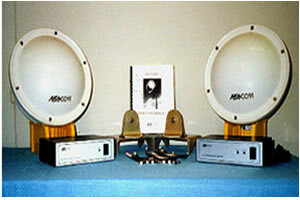 The early M/A-COM, FM analog microwave radios were, and still are, at the top of their category for excellence and reliability of NTSC video transmission. Available in 2, 6, 7, 11, 12 and 13 GHz, the G-Line requires very little maintenance. Several upgrades and revisions to an already robust design made the MA-G Line a very successful solution to long haul analog video connectivity. 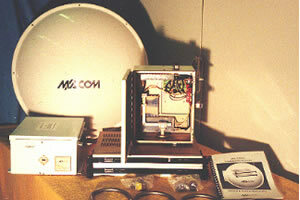 Combined with an external PAC-4 audio modulator and an external PAC-5 audio demodulator, the M/A-COM G-Line Microwave Radio Series was unsurpassed. The MA-18CC and MA-23CC were created for shorter path lengths. 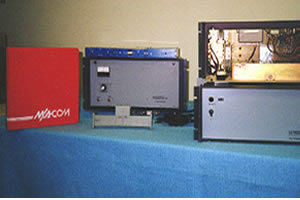 Unlike the G-Line, these radios use a split design, with the RF unit mounting directly behind the antenna. Depending on the application, these radios can be equipped with up to three internal audio subcarriers. The MA-23VFM is an economical alternative to the MA-23CC, designed for very short paths and stereo audio capabilities.